As everyone knows, the prom is a monumental night in your life. Prom night is the largest social event in high school, overtaking homecoming and any other dances your school might host. Whether it's your junior or your senior prom, we know that planning for your prom can be pretty hectic. If you're a girl, you have your dress to pick out, your hair and makeup to coordinate, not to mention all the little things like stockings, remembering to pick up a boutonnière for your guy from the florist, getting batteries for the camera, and other prom to-do list items that you don't want to let slip from your mind. And fellas, you're not exempt from this, either! You've got a suit to pick out, and a corsage to pick up. And that’s just the beginning… all of this only AFTER you ask the person you are interested in if they'd like to come to prom with you! 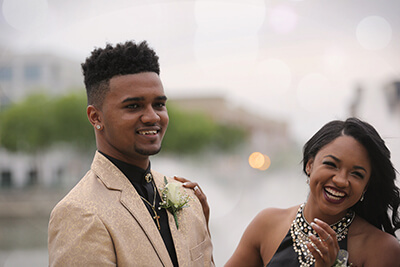 With all of the details to work your head around, the best advice we can give you for your prom is to start your planning early. Starting early will help to ensure that you have that perfectly magical prom night, without any hitches or last minute scrambling. We'd recommend doing your pre-planning at least three months in advance, starting off with shopping around for a dress or tux and saving up some money for the prom. Starting early will also help your wallet: If you wait until the last minute, stores will spike their prices due to demand. Don't let that happen to you! When you get to one month until prom mark, it's time to start putting together the details. Try out your completed ensemble to ensure that you really like all of the pieces together, and check around for jewelry or cuff-links you might want to purchase to complete your look. If you're a girl, you might want to book any salon appointments you might want for the big day now. If you're doing hair and makeup at home, now is the time to start figuring out what you want to do for hair and makeup, and testing yourself for time. You might also want to set up transportation services like Detroit Party Bus, before they all get snapped up. As the prom draws nearer, it's easy to get swept away in the excitement of it all. But keeping a level head will have a big payoff when you actually get to your prom night, knowing that you have everything taken care of. Taking the time now can help stop unforeseen setbacks in enough time to remedy them! Around a week or two before the prom, you should call and order a boutonnière or a corsage for your date. Make sure to call the salon and confirm your appointments if you made any, and you might want to try out your outfit to ensure that it still fits properly, and that you still like the look. Make sure you have comfortable shoes, because in a week, you'll certainly want them to fit well while you spend the whole night dancing! When you're this close to the day, it's time to take care of all the little things that need to be done so you won't be running around tying up loose ends on the big day! Now is the time to take care of the little accessories for your outfit (stockings, polishing your watch, whatever). Also, it might be a good idea to go on ahead and lay out your outfit for tomorrow, and gather up all the little things you might need, such at batteries for your camera, a compact and some lipstick if you're a girl, and some breath mints. Don't forget to pick up your corsage or boutonnière from the florist's, and call and confirm your driver and the salon. It's the main event, the moment you've been working toward: prom night! Now, you've already taken care of everything, so all you have to do is get dressed, gather up your friends, and go! If you're going to a salon to have your hair or makeup done, you might want to wear a button down shirt or blouse, something easy to take off so you don't ruin all that time at the salon. Don't forget to take lots of pictures with all your friends before you go, and make sure you have extra batteries and a memory card for your camera, because you'll certainly take tons of pictures when you're there! With all the whirlwind planning and coordinating that goes on with prom, we can help make one thing easier: transportation. Renting out our Detroit Party Bus is an easy way to ensure that you'll get to the prom on time, without worrying about trying to drive or park at the prom. And renting transportation doesn't have to be expensive! With the limo bus, you could get ten or even more of your friends together, and everyone can pitch in for the ride. If you and your party want to go out to dinner before the prom, or go to or burger joint after the dance, or onward to the hotel or your ultimate party destination, the party bus will take you anywhere you need to go. No need to try to coordinate rides or navigate, just easy transportation with the limo bus. Taking the limo bus is a totally one of a kind way to arrive to your prom. Why not be the only kids at Wayne High to arrive in a party bus? Who else at Macomb or Oakland High will have not just a ride to the prom, but a traveling party that will take you to the prom and anywhere else you might need to go? And you won't have to worry about mom and dad freaking out about you or your date's driving skills, or all of the drunks on the road. With the party bus, you'll have a safe, licensed driver who is trained to know the ins and outs of Detroit, so your parents can rest assured that you'll make it back home safe and sound. Just remember that this is your prom, and it's supposed to be fun! Don't let planning stress you out, just take it one thing at a time, and have a great night that you'll remember for life! Catholic Central High School - Redford Twp. Chippewa Valley High School - Clinton Twp. Dakota High School - Macomb Twp. Eisenhower High School - Shelby Twp. L'Anse Creuse High School - Harrison Twp. L'Anse Creuse North High School - Macomb Twp. Plymouth Christian Academy - Canton Twp. Plymouth High School - Canton Twp. Salem High School - Canton Twp. Utica Center for Applied Learning - Shelby Twp. Waterford Kettering High School - Waterford Twp. Waterford Mott High School - Waterford Twp. West Bloomfield High School - West Bloomfield Twp. Woodhaven High School - Brownstown Twp.